1. The term "kingfisher" means "king of the fishers." It is more interesting to look into the meaning of the scientific words for the belted kingfisher. "Mega" translates to "big" and "ceryle" comes from the Greek word for "seabird". The second name, "alcyon", comes from Greek also and goes back centuries into Greek mythology. According to myth, a lady named Alcyon grieved so much for her drowned husband that the gods took pity and turned them both into kingfishers. 2. 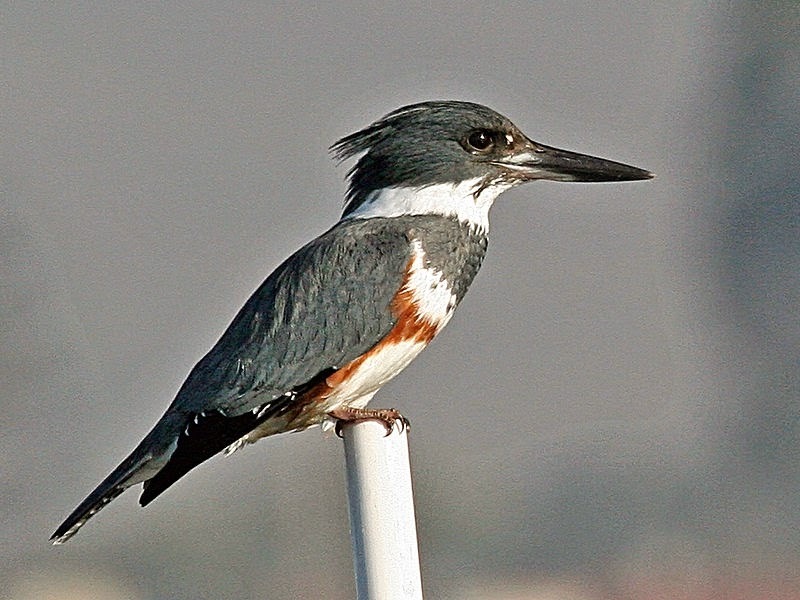 The Belted Kingfisher is a common waterside resident throughout North America. It is often seen hovering before it plunges headfirst into water to catch a fish. 3. The Belted Kingfisher is a large bird that is bigger than a pigeon. It can grow up to 13 inches long. 4. It looks top-heavy because of its large head. The head looks big because of the very large crest of feathers on the top that resembles a shaggy Mohawk. It also has a large beak that is long and sharp. The bird is colorful with a bluish-gray body, white belly, and white collar around its neck. 5. Both males and females have a bluish breastband, but the females have another chestnut-colored breastband, as well. 6. Unlike many birds, the female kingfisher is more colorful than the male! Most male birds are more colorful than female birds. However, unlike many birds, the female kingfisher is more colorful than the male. 7. Belted Kingfishers often sit high on electric high wires above feeders. 8. They will sometimes fly under the water to escape attacks from peregrine falcons and hawks. 9. Kingfishers will dive for fish under the water, then return to a perch, where they beat the fish on a limb, then toss it into the air and swallow it headfirst. 10. They nest by digging burrows on the banks of canals, lakes, and ponds. 13. 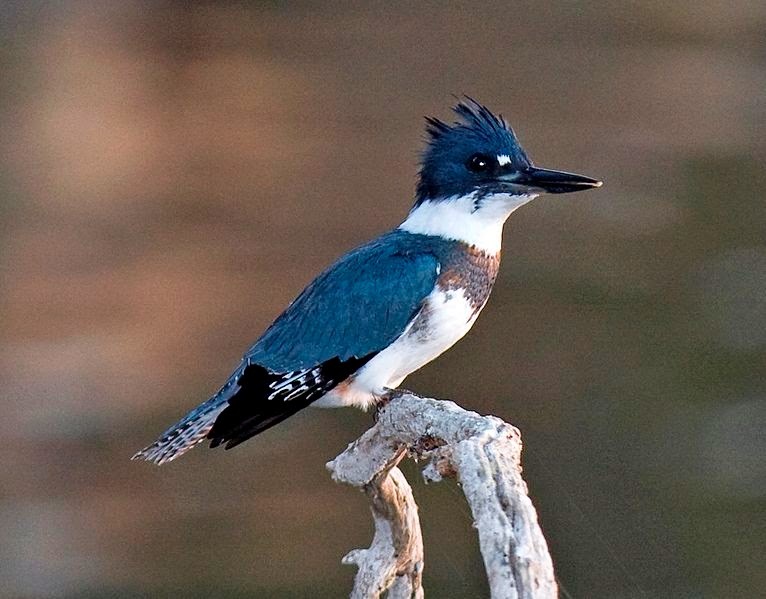 The Belted Kingfisher has a fast, repetitive, cackling rattle. 14. The breast band on juvenile birds is a mixture of cinnamon or brown and slaty blue. Juvenile males have a tinge of faint rufous along their flanks, and juvenile females have a faint rufous belly band. 15. Unlike other perching birds, two of the kingfisher’s toes are fused for much of their length, a useful arrangement for digging burrows yet challenging for walking. 16. Fish that swim in shallow waters or near the surface are the primary food choice, but Belteds will also eat crayfish, young birds, aquatic invertebrates, and amphibians. 17. Belteds typically excavate gently upward-sloping tunnels deep into earthen banks for their nests, but burrows have also been found in beaver-generated mud slides, root wads of fallen trees, sand dunes, sawdust piles, sand and gravel pits, and roadcuts.